I found out about the challenge in mid-February this year and about a week later I signed up. I loved this challenge so very much and am so grateful for having been given the chance to take part. One thing that really helped was the little calendar that I made. I wrote down each letter and each day on a piece of paper and filled it in with lots of possible topics. That means that I was able to find something for each letter and that you can expect many more Nordic-themed posts in the future, since I have many left over topics! That's it really, for reflections. I just want to say a great big sparkly thank you to all of you who visited me, supported me, commented me, followed me and encouraged me throughout the challenge. I really value each and everyone of you, my dear friends, and I'm so glad I decided to take part in the challenge in the end. Even if I don't always have time to comment, you can be sure I'm spending minutes with you, here and there, reading about your days and sending you wishes. I'd like to give each and every one of you a warm, squishy hug! Calendar looks fun. I was never in Oslo, but have visited quite a bit of your country. Places like Stavanger and Bergen. Cruised the fjords too and love Bløtcake (sp). All before you were born. I came by your blog a few times and I enjoyed your posts. Looking forward to reading more in the future. 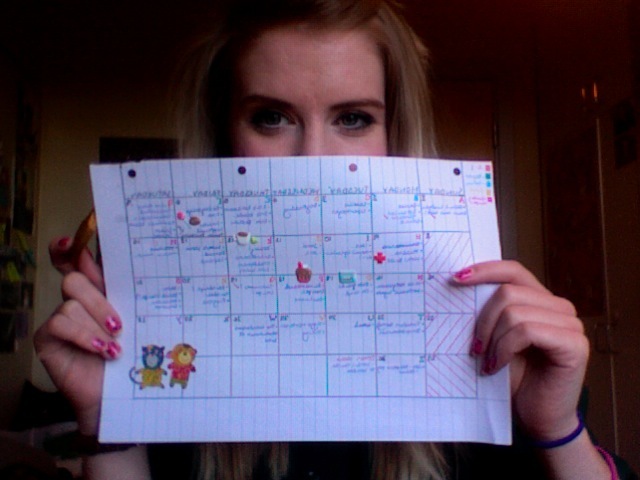 I have a planner that's only for my blog, and I used that to make a plan for the challenge. Of course, it didn't matter. I still ended up with days I scrambled together, but that's okay it was still fun. I really enjoyed visiting you during the month and I'll keep coming back. I am so glad to have met you! I took you up on the "award" challenge so come on over - and bring cake! Long squishy hug to you too!! Congratulations on surviving the Challenge!